No animal is able to digest cell walls of plants (cellulose) without the help of bacteria. Cattle or reindeer digest grass by provinding it to microbes in their complex digestive system with stomachs and long intestines. It takes at least 48 hours before the material is digested and leaves the body as faeces. A goose has a much simpler digestive tract and all grass leaves the intestine within two hours. Therefore, geese have to feed on the best quality of grasses. Top left, you can see a stomach and intestine of a barnacle goose. The stomach has a size of a chicken egg, Two plates grind the broken leaves into smaller pieces. This is the only physical fragmentation of the plant material as a goose has no teeth. The digestive tract of a goose is short and every grass leaf leaves the body within 2 hours. Making 100 bites per minute, the goose produces a complete dropping every 5 to 10 minutes. The dropping contains lots of undigested material. On the second row, you can see a picture of the digestive system of a reindeer. A reindeer is a ruminant. All food is several times fragmented by the teeth, before it moves futher into the digestive tract. Al food stays at least 48 hours in the animal, so it can be digested properly. Near the end of the intestine, there are appendici, where difficult digestable parts can be set aside for further breakdown without blocking the rest of the food. 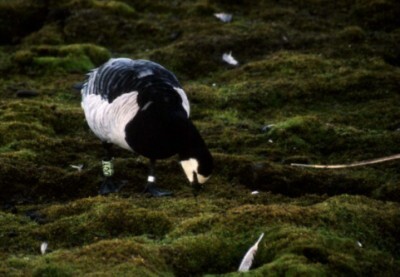 Goose faeces contains leaf fragments which can be classified under a microscope. This classification allows a reconstruction of the diet. 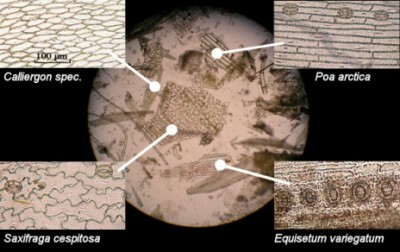 The picture on the third row to the left is taken through a microscope. You can see parts of plants as they can be found in goose droppings. 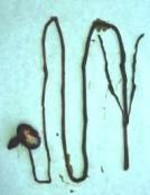 Every leaf has unique characteristics of cell wall shape and stoma. The number and size of the plant fragments is used to reconstruct the full diet. During microscopic examination, we sometimes encouter eggs or specimen of parasites, which indicate that the host has been infected. Because the geese produce droppings at a fixed time interval of 5-10 minutes almost constantly through the day, it is possible to use the droppings as an acurate measure of goose presence. 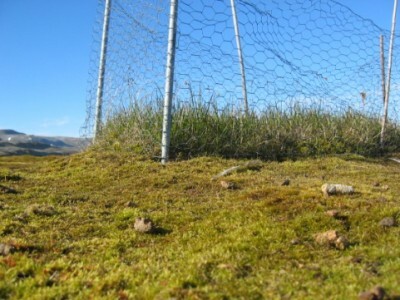 Goose droppings are counted every week in plots of 2 x 2 meter and removed from that plot. The amount of goose droppings is calculatd into goose days. Each dropping leaks nitrogen into the ground. On the arctic tundra, nitrogen is limiting plant growth and an extra amount of nitrogen is quickly turned into new plant biomass. In some areas, plant production might be up to 150% higher in grazed compared to ungrazed plots. Geese farm their own food and have more food available at a plot while grazing. Only after building an exclosure, you can see the difference of grazed and ungrazed areas. Highly favoured food plants seem to disappear completely out of the grazed vegetation. Geese are such efficient grazers that the plants are nibbled to the moss layer and not visible anymore. 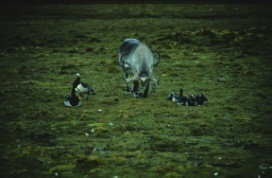 The early spring growth of grasses has the highest protein content, necessary for growth in geese. During summer this protein content decreases below 18%, which is a threshold level for the geese. By migrating north, geese follow the green wave of spring grasses. 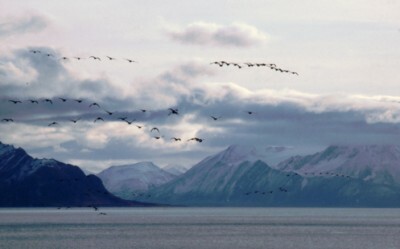 During stop overs, they put on a lot of reserves and fly to the arctic. There they arrive before grass production is tarted. But after laying and incubation, when the young hatch, it is spring at the site with lots of good quality food. The use of artificial fertilizer in the Netherlands has changed this story, Now grass quality is improved and stays high for a longer period over the summer, especially when the grasses are grazed by sheep. Now there is less need to migrate north and some geese have discovered the new situation. They stay and breed in the Netherlands. 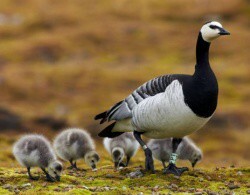 At this moment, the number of barnacle geese breeding in the Netherlands exceeds the number of barnacle geese breeding on Spitsbergen. 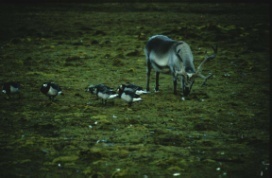 On Spitsbergen, reindeer feed on goose faeces. They have a digestion which can use most of the energy left by the geese. 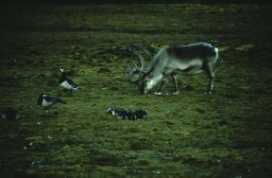 When a group of geese has slept more than 30 minutes, the reindeer come in and chase the geese away to feed on the 3-4 droppings which have piled up behind the tail of the goose. Reindeer feeding is still selective. They only eat droppings from a goose which has been on a grass diet and reject droppings from geese, which have been on a moss diet. In this way they choose for droppings with the highest nutritional quality. 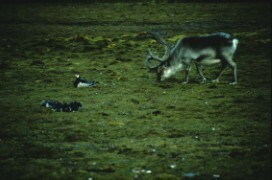 Above, you see pictures from a reindeer feeding on goose droppings. 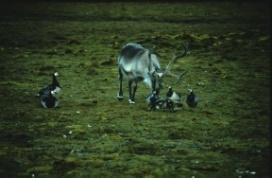 The reindeer walks towards the goose family. It chases the male away and feed on the pile of droppings.In deze kolom zie je hoe een rendier afloopt op een slapende ganzenfamilie. Than it moves towards a group of juveniles and chases them to gain access to the pile of droppings. The scientific paper about this topic can be found here. 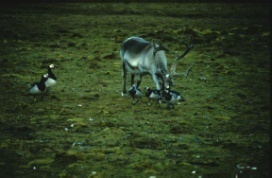 This page has been given the following keywords: [reindeer] [plants] [science] [barnacle goose] You can click on each keyword to get an overview about related pages.